Ashlynn lost her first tooth. 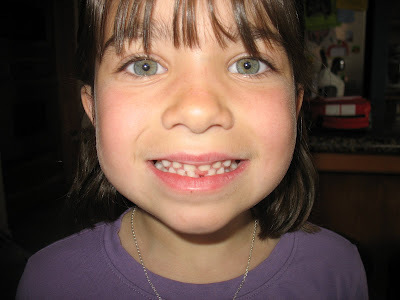 Rather, the dentist pulled it because, as she told everyone, she had a "shark tooth" growing in behind it. She did great. No complaints. One day I asked Briggs if he wanted to go outside and try to learn to ride a two wheeler. He said sure. Then 5 minute later, he was rifing on his own. No joke. It is just like potty training and learning to read with him. He makes it so easy to be his parent! The kid is a fast learner, just like his Dad. Now he zips all over the neighbor hood on his little 12" bike, looking the part of a circus clown. So cool. You will have to let us know how you teach a kid to ride without training wheels. Caleb is loving his bike but moms not ready for no training wheels yet! I which I could have seen that! I bet he looks just as cute as his daddy did when he learned to ride a little two wheeler. nate and ryan were like that, i said do you want my help? "no" and off he went, two years later i helped ryan for like five minutes and sure enough he was riding like a pro. kyle on the other hand...not so much...wont even get on the thing. I forgot to tell sweet lil Ashlynn how 'old' she looks now! I hope the tooth fair came to see her, if so, I should hear about it. Yeah, Ashlynn on the tooth! And, congratulations to Briggs on the bike riding. Now he and Gehrig can tear it up together. I like to blog to try and preserve our family memories. Our Three children have an uncanny grasp of the English language and it would be a shame to forget such words as "cutenize".